“The role of the artist is to make the invisible felt. To help a people understand their experience. To document this search and understanding. To challenge, question, and ask. To shed light in dark places. Her adjacent influence is, as she put it, “the physicality of language.” One of the best, and most formidable, unions of listening and language, to my recent recollection, was Marina Abramović’s “The Artist is Present”—performed from March 14 to May 31, 2010, at the Museum of Modern Art. For 736 hours and 30 minutes, Abramović sat in front of 1,545 sitters across from her. Hi-fi. Lo-fi. Listening without losing. Joining the pursuits of Abramović and Mistral, contributing to the artistic ledger of meaningful transactions, and reinforcing the advantage of art on the side of the vulnerable, Pope’s work and talk urged CreativeMornings attendees to endure this challenge: Still listen. Big thanks: to AgencyEA, Savage Smyth (who also hosted), Green Sheep, Lyft Chicago, for being Partners of Chicago CreativeMornings #62; to new organizer Jen Marquez who accepted the chapter’s hosting responsibilities from Knoed Creative who spoke at Chicago CreativeMornings #7; to the team of volunteers for greatly helping to have CreativeMornings happen monthly in Chicago. 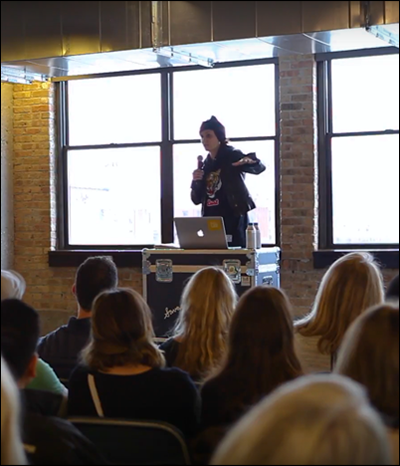 Especially big thanks: to Tina Roth Eisenberg—Swissmiss—for inventing CreativeMornings in 2008.